Polysilicon materials manufacturer for the solar industry in Moses Lake, WA. Company wanted to reclaim polysilicon powder captured by their existing dust collection system. Due to the vast size of the facility, the amount of reclaimable powder was considerable and would require 13 IBCs designed for Class I, Div II and Class II, Div II environments. Locations of the reclamation sites would be in three separate areas throughout the plant and at different altitudes. Due to the nature of the polysilicon product, a highly contained system was required. Eventually, the reclaimed product would need to be repackaged from IBCs into bulk bags for shipment elsewhere. IEDCO provided the polysilicon powder reclamation system (IBC fill system) and the bulk bag filling system (FIBC fill system). The IBC fill system consisted of 13 IBCs, 10 Pneumatic Conveying and Batching Systems – all of which were designed for hazardous environments and high containment. Split butterfly valves were used to maintain the containment requirements. The portable IBCs were filled & emptied through the same valve and required both fluidization and nitrogen purging. The FIBC fill system consisted of a Post Lift IBC Lift Inverter and a Bulk Bag Fill System that needed to fill bulk bags to an accurate weigh in a fully contained manner in a nitrogen purged environment. In order to maneuver the IBCs throughout the facility, IEDCO also provided a Cable Hoist Elevator. Providing this complex system was a massive endeavor with equally impressive results. 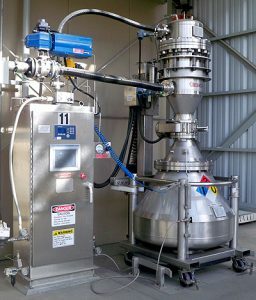 The new silicon powder reclamation system has created a new source of revenue for the company, as well as eliminated the need to dispose of what was once discarded material. Industrial and reagent grade chemical manufacturer in Minneapolis, MN. Company needed to repackage an assortment of products received in bulk bags or paper sacks into a variety of different sized buckets and/or drums. They were looking for a linear system that would accomplish this in a contained, safe, efficient, and ergonomically friendly fashion. IEDCO provided a complete material transfer and batching system consisting of 2 bag dump stations (with compactor), 2 bulk bag unloaders with surge hoppers, 4 vacuum tolerant sifters, and 4 pneumatic transfer batching systems. A portable delumper was also included to interface with either the bag dump or bulk bag unloader systems as some of the received materials become densified during transit in either bag type. This linear transfer system was designed to keep operator’s feet on the ground while being able to access all aspects of the process. Product was discharged from either the bulk bag unloaders or the bag dump stations and fed through the vacuum tolerant sifter via the pneumatic conveyors in the next room. 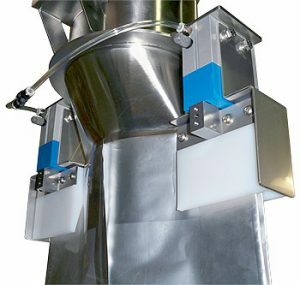 The pneumatic conveyors (mounted on pneumatic lifts to allow for docking & undocking with the containers) accurately filled a variety of different buckets and drums on a roller track scale system. 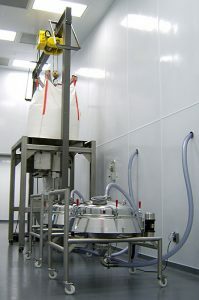 This system allowed the company to create accurately batched containers of a variety of chemical ingredients for distribution from both bulk bags and paper sacks while increasing operator safety by keeping them on the floor at all times due to its linear design. International specialty chemical manufacturer in Assonet, MA. Company was packaging their product in drums, but wanted the flexibility to also start packaging into pleated foil bags. The drum fill system was originally provided by IEDCO and allowed for the metered filling of drums on a scale system from an existing mixer. Rather than introduce an entirely new packaging line, IEDCO retrofit the existing drum fill system with a new, custom designed foil bag fill head system that could utilize the existing floor scale and batch controller. The custom fill head featured specially designed bag gripping pads. Operator safety was a primary concern, so the gripping pads were designed to prevent operator fingers from accidental insertion into the pinch points. A foot pedal was incorporated to allow a single operator to use the system while maintaining control on the foil bag being filled. This system allowed the company to begin filling foil bags with their product without the major investment on equipment or a new filling line.